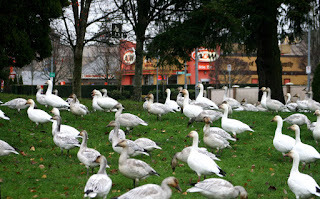 This is turning out to be a very big snow goose year in Richmond, BC. I haven't heard any reliable data, but a general opinion is that there sure seem to be a lot of them this year. I don't know how you would count them once they're here. They course around the city and beyond, dropping by the hundreds, thousands, or tens of thousands into parks, schoolyards, and wilder areas near the mouths of the river. 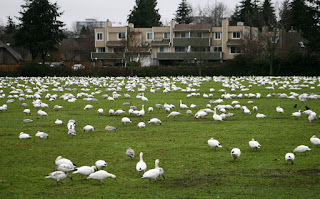 The flock in these pictures is grazing between Garden City Road and St. Albans Road, half a block south of Blundell Avenue. Large numbers have been visiting this green space over the past week. Today, I would estimate that there were between 10 and 20 thousand -- but how the heck to count them? They were in every corner of several acres of sports field divided up by baseball diamonds, tennis courts, and school buildings. I'm certain that this is the biggest flock I have seen in this city since they started overwintering here a decade or so ago. This seems to be a "bigger" year than the last big one (2011-2012), which was when our son did a school project on Snow Geese in Richmond. A lot of information on the geese can be found here. Snow geese, from Siberia to suburbia. A diamond in the rough, a needle in the haystack, a blue morph. Even a single bird is striking. A flock of thousands is something else. Something a lot bigger. Video from near South Arm Community Centre, December 27, 2016. Last weekend, the school near our home was inundated with geese, for not one, but two days. Last year, we hardly had any. 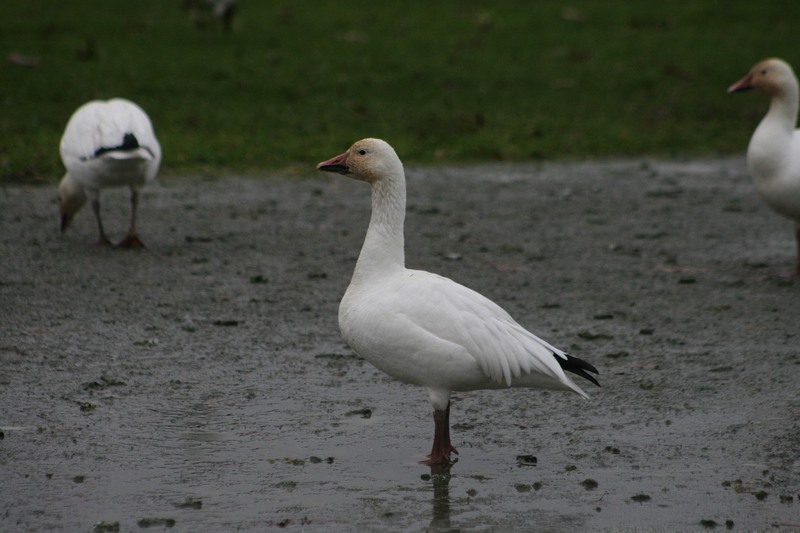 I have joined the Comox Valley trumpeter swan count; this is my second season. Last year, we counted hundreds of swans; this year, I have seen 4. 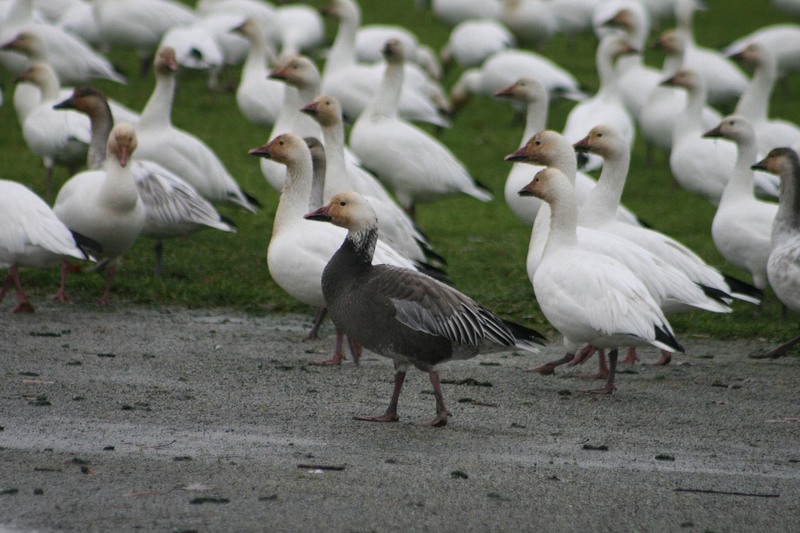 But the snow geese are here, too, in record numbers (not like your numbers, of course), and staying around longer.